When I see these types of meme’s being posted by people that believe them to be true, I know that they are ignorant and haven’t analyzed and felt the true implications of the statement, and that they are in denial of their issues. If that statement were a truth, then applying the most basic logic and reasoning to, “you are not your problem” would also apply to every living person on this planet. 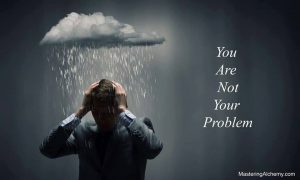 If you are not your problem, then by denial, you have to blame everyone and anything outside yourself as the problem. What you are also doing with that belief is making your happiness dependent on another person, place, or thing. In other words, you are giving your power away as they now CONTROL you. Trying to fix the problem using that Belief System (BS) doesn’t work, no matter how hard you try, it is at best a “quick fix.” So if that doesn’t work, you need to do the reverse or the opposite to try to solve the problem by realizing that the problem is not outside yourself, but inside you. If pushing the door doesn’t open it, maybe pulling it will. For the universe to make you aware of the issues you have chosen to heal by reincarnating, it needs to bring you experiences that will trigger and activate you. The problem is with your Mind that is still running on its old imprints, programs and beliefs, that until it is aware enough to desire to change, will just keep going in circles, trying to apply the same fuzzy and twisted logic that created the problem, in trying to fix it. With self-awareness comes self-empowerment, and until you choose to end your denials and look at you as being the problem to your issues, nothing changes. This entry was posted in Denial, Feelings - Emotions, Imprint-programs-beliefs, New Age, Self-Empowerment, Society - Culture and tagged control, denial, Happiness, ignorant, self-aware, Self-empowerment by johnrieger. Bookmark the permalink.